Cargo has arrived at the International Space Station to support approximately 40 of the more than 250 science and research investigations that will be performed during Expeditions 43 and 44, including numerous human research investigations for NASA astronaut Scott Kelly's one-year mission in space. 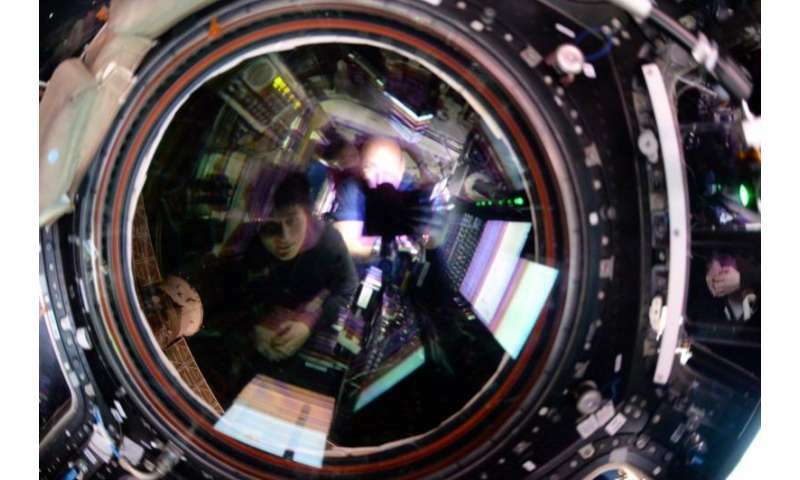 Kelly (@StationCdrKelly) posted this image to social media following the grapple and berthing of the SpaceX Dragon cargo craft, writing, "Samantha Cristoforetti and I reflecting on Dragon's arrival. #YearInSpace"
Expedition 43 Flight Engineer Samantha Cristoforetti of the European Space Agency, with the assistance of Expedition 43 Commander Terry Virts of NASA, successfully captured the SpaceX Dragon spacecraft with the space station's robotic arm on Friday, April 17 at 6:55 a.m. EDT, while the station was traveling 257 statute miles over the Pacific Ocean just east of Japan.